"Get your chops into that" I'm thinking as the giant gelato is handed to me. As an occasional post, Sketches is opening the old travel cupboard door and reliving past adventures. Hopefully to inspire if you're about to visit or plan to visit places featured. Up first is Rome. When in Rome: eat ice cream! Alright so its one of the most beautiful ancient cities in the world, boasting some of the great ancient architecture. Trust me The Colosseum and The Forum really are that good. But the food, the gelato, oh the gelato. The one featured came from a shop close to the Trevi Fountain and for the 5 odd Euros it cost, it was worth it. Away from the joys of licking your way through gelato, you'll find fountains are another key feature of Rome. You can't beat a ornate fountain can you? And if fountains are your thing then Rome delivers in....waterfalls! What better way to pass the time than sit in a cafe, sipping a coffee and watching the fountains and the world go about its business. Essential Rome experiences. Have I mentioned food? 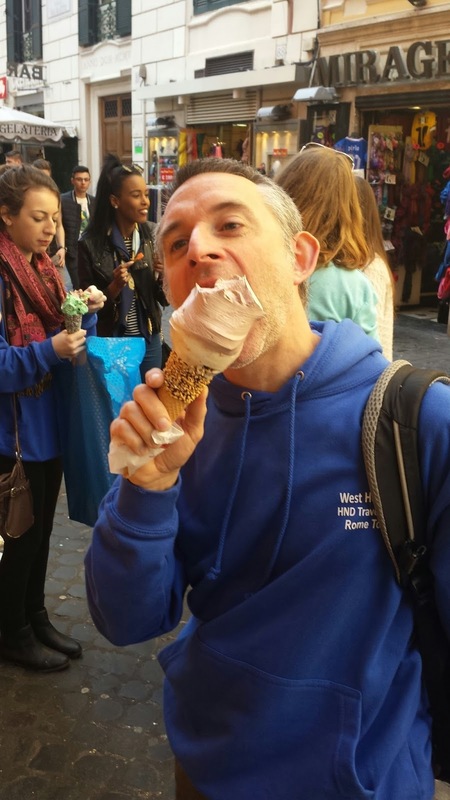 Aside from ice cream, Rome has an abundance of food delights. Alright eating pizza is high on many a people's lists when thinking of food in Italy. A bit like you have to have sushi when you go to Japan (you do need too by the way, nowhere better to eat it). But throw in the pasta, bread and the ham and cheeses which are also rather yummy and you have a potpourri of delights. Even on a budget (like we were) you can still enjoy the culinary pleasures this city brings. The best way to explore central Rome (or any city for that matter) is to see it on foot. Explore the alleyways, find little restaurants and cafes, pop your head around a corner and find a magnificent church or Roman building. It's that kind of place. Rome is a treasure trove of delights and needs to be explored without a map (if you can). Walk through the narrow streets from the Trevi fountain and you'll stumble upon The Pantheon and Navona Square. The perfect way to spend an hour or three. Zooming around Rome's roads can be something of a hazardous activity. Although I wouldn't recommend it, in the hands of a local it was thrilling. We had to change hotels and was transported across the city in tiny cars, baggage and all. We survived to tell the tale and although fun, its not something I'd wish on others. If Rome's roads aren't your cup of tea then it has a good tram system and a smaller subway network that takes you close to the main attractions, parks and the Zoo. Although be prepared for a hike up the hill if you intend to walk to the zoo. With Rome it's all about wandering. That's where the joy of visiting this city comes from. Up and down the Spanish Steps; fighting your way past the throng of people that are sitting eating their lunch to a stroll around the ancient ruins of The Forum. Wherever you go there is a real sense of history as you walk around and observe. The modern and ancient happily live alongside each other. Although a tourist trap at its heart its still a city where you can feel apart from the crowds. Rome is a joy, a wonderful city, up there with the best that Europe can offer. A must visit on anybodies wanderlust list. Oh and there's Vatican City of course! Follow up - On Friday there will be a visual interpretation of Rome in the Old Journey Through New Windows series.